When Christ came Himself, His WHOLE gospel, His message was prophetic. It was a prophecy. I think you may not have heard that before. Have you heard Jesus proclaimed as a coming governor, a ruler, a king? Or only as a Savior who shed His blood for us and who gives you salvation, if you just have the password and say "I receive Jesus; and I get, I take and I accept Christ." Let me tell you there is a lot more than that to it. You have to do that, that's true. But there is a lot more to it than that. They are leaving something out. Now we have materialism in the world, but we also need the spiritual knowledge and the true values that would help us to be happy with our materialism. We need the entirety of it. I would like to have you notice next another prophecy about His coming, which is in John, the eighteenth chapter of John. this is when Jesus Himself was on trial for His life just before they put Him to death by crucifixion. And it is in John the eighteenth chapter and I would like to read verse 37 first. He was on trial before Pontius Pilate who was a Roman governor there in Jerusalem. But how many believe it when they do hear it? How many of you have believed what I am going to give you tonight right out of the Word of God? And this is God Himself speaking. Will you believe Him? Now I've shown you this world, it started with the first Adam It was started by them rejecting the way of God, the law of God, the way of love. And starting out on the way of get. Taking to themselves the knowledge of what is good and what is evil and thinking it is good to take away from other people — to elevate and exalt the self and to be selfish and be competitive and to take away from others and to go into violence and war and that is the kind of world we have had. That's the kind of world we've had. "My kingdom is not of this world [that's this world. Notice He's talking about two worlds here? We are in a world now and there is going to be another world. Jesus' kingdom is not of this world]. If it were, my servants would fight" (John 18:36 paraphrased). But now His kingdom is not of this world. Now then, what was the gospel of Jesus Christ? Have you heard the gospel of Jesus Christ? You think you have, but many of you have not. You have heard A GOSPEL OF MEN — ABOUT JESUS CHRIST, but the gospel of Jesus of Christ is the gospel Jesus Himself brought and the gospel He proclaimed And I'm going to read that to you tonight. You know we used to have a bank of Morgan in New York. It didn't mean it was a bank inside of Morgan — it meant that Mr. Morgan owned it. The gospel of Christ is the gospel that belongs to Christ — the gospel He preached, not a gospel about Him. People have been preaching about Christ, but they have not preached Christ's message that He BROUGHT. They preach about the messenger. Christ was sent from God with a MESSAGE. CHRIST WAS A MESSENGER FROM GOD and He brought a message to this world. And that message is the gospel. I am going to preach to you that message tonight. Will you believe it? Christ preached that message to thousands and thousands of people. Twice He preached to 5,000 men, not counting the women and children. That's 10,000 men, not counting women and children. How many people believed what He said? Only 120 people believed what He said. Turn to your Bible in Acts 1, verse fifteen. First chapter of the book of Acts verse 15. There were 120, that is all that believed what He said. People don't want to believe what He said. They believe on Christ, but they don't believe Christ. There is a great difference. I hope you get that difference. I tell you one reason I try to slip out around the side, because you are the hand shakingest people I ever met in all my life and every one of you would shake hands with me if I could and I, I just can't shake hands with so many of you. And I would like to if I could, because I love every one of you. I know I have been in audiences here where it just wrung my hand out before I got through with you Filipinos. [Laughing] You just love to shake hands with people. And I think a lot of you love me and I love you and that is the way it ought to be. "Now after that John was put in prison, Jesus came into Galilee, preaching the gospel [what gospel — WHAT WAS HIS GOSPEL?] preaching the gospel of the kingdom of God (Mark 1:14). A government. Last night I gave you a little joke. We had both good news and bad news — but I tell you I'm preaching just good news tonight. I don't want to preach the bad news tonight; I gave you that last night. This night you are getting really the good news in the end. Now, He came preaching the gospel of the government of God; the kingdom of God. And incidentally the kingdom of God is a divine family that will rule the government of every nation on the face of this earth. That is the message Jesus came preaching. "And saying, The time is fulfilled, and the kingdom of God is at hand: repent ye [therefore], and believe the gospel" (Mark 1:15). That is, believe the good news. What do we repent of? What is the way the world been living all this time? Ever since Adam, the world has been living the way of get. The world's been living in violation of the law of God which is give; which is outflowing love toward others. There is nothing wrong with that, that outflowing love. I come here to give to you people, not to get, I don't expect to take anything away from here. But I did come to give. I'm giving you something spiritual tonight. I'm giving you something worth billions and billions of pesos. That is what I'm giving you tonight, and I'm in the business of giving not getting. I'm not in business for any profit at all. The only profit I get is all spiritual, believe me. Now then, the government is the gospel Jesus came to preach when He is going to govern and rule all the nations of this earth in the kingdom of God. Now He said repent, why? Of the way people have been living all this time ever since Adam. Repent of the way of GET. And the kingdom of God will have; every government has to be based on a law or a constitution. Now just let me see, two, three, four days ago — last Tuesday — yes it is about five days ago now. My, time does fly doesn't it? But last Tuesday Ronald Reagan took the oath of office and he swore solemnly with his hand on the Bible and his hand — one hand on the Bible and the other hand raised, that he would faithfully protect the constitution of the United States. That is the foundation of the government and that is what he is sworn to protect and preserve and to administer. Now what is the constitution, what is the foundation of the government of God — the government that will bring peace to all the world? It is the law of love, the way of give. And He said repent, because you haven't been living that way. He said repent of the way you have been living. We have been living the wrong way and because we live wrong, we brought troubles on ourselves in this world. And let me tell you there is a lot more trouble in other nations than there is here in your nation, because maybe you have lived a little better than some of the other people. So you are not troubled quite as bad. But all nations are troubled, because none of us have lived as good as we should. You know that and I know that and we all do. Every government is based on a foundational law. Now the gospel is prophetic. Jesus didn't come to set up the kingdom of God then, He came to announce that He would do it in the future. That is a prophecy that He will do it. A prophecy has to do with what is going to happen in the future. "It is not of this world"... Jesus said to Pilate; I read that to you remember just a few minutes ago. "My kingdom [He said] is not of this world..." (John 18:36). It is of another world altogether, future. The way of this world is get; He said repent of that and believe this message; this good news of the coming way of God and the foundation of that government — which is love, the way of love. The whole world is on the way of get. Now that gospel was preached in the years between 27 and 31 AD. In the year of 31 AD Jesus Christ was crucified. In that year after He was crucified, after three days and three nights in the tomb, He was resurrected. And after forty days being with His disciples and the future apostles, He ascended up to heaven. And then ten days later, on the day of Pentecost, the Holy Spirit came for His church. Started by those very apostles and started by that 120 people that I told you about a minute ago; but now that was in the year of 31 AD. Do you know what happened? They went out to preach that gospel and many of them were put to death for doing it. They put Christ to death for preaching that gospel! They didn't want to hear that gospel — the good news of the way of love — the good news of a government that is going to administer that, that kind of a government on that kind of a constitution and foundation. And bring happiness and peace to all people. People didn't want that, so they put Christ to death. Then they began putting His apostles to death as they went out preaching that same gospel. They had changed to a different gospel than the gospel of the kingdom of God. I want you to notice that, a different gospel than the good news about the government of God. And repenting of the way of get and turning back to the way of get again is what they were doing. The gospel of Christ was suppressed and by 70 AD that gospel was not preached any longer to the world. Instead men began preaching a gospel about Christ. They preached that Jesus was the Messiah. They preached just receive Christ. They preached grace, but they said the law is done away and you don't have to obey that law of love. You can go on getting, you can go on the way of GET; you don't have to live the way of outflowing love — the way that will be the law of the kingdom of God. And that has been preached for 1950 years. And I want to tell you that fifty-four years ago I came to learn about the truth of the government of God. And the way of God and the way that God says we should live. And what is sin. What is sin?. It is the transgression of that law. First John the third chapter and verse four: the only place in the Bible you will find where sin is and then a definition. WHAT IS SIN? I was brought up in a respectable church that taught me that sin was going to a show or a theater. Sin was having a pair of dice in your home or a deck of cards. And I don't believe that at all; I think that you can use a pair of dice and a deck of cards in the wrong way that could be sin. But I don't think that a deck of cards or a pair of dice of themselves are sin. And yet that is what I was taught as a boy. I didn't believe that Christ came to set up a kingdom or a government. I didn't believe that at all. I began to read it in this book. And I began to believe what God says in this book. Will you believe it or will you go away and just believe whatever you've heard from other people instead of what God says? Well that is your problem, not mine. Now Jesus Himself prophesied about world events and He looked down into our time and told what is going to happen. I said them to you last night that I would tell you the prophecies of our time right now and what's going to happen. Now I want to get into that right away. And I would like to turn to Jesus' own prophecy in Matthew 24. This is the one — the most important prophecy, I would say in the New Testament. You'll find the same prophecy also in Mark 13 and Luke 21, where you'll find the same prophecy exactly. But I have used Matthew 24 usually, because I believe it is a little more explicit although you find almost the same thing in those other two places. Now Matthew 24 and I would like to begin right at the first verse. "Jesus went out of the temple [there in Jerusalem He was in the temple and He went out of the temple] and departed from the temple; and the [His] disciples came to him [for] to shew him the buildings of the temple. And Jesus said unto them, See ye not all these things? [that is all the buildings, more than one building in a temple and usually a castle or a palace of a king today is more than one building. And He said to them]; See ye not all of these things? verily I say unto you, there shall not be left here one stone upon another that shall not be torn (thrown) down" (Matthew 24:2). They could hardly believe that. That, that wonderful temple that Solomon — no this isn't the same temple Solomon built, this is one that was built 70 years after Solomon's temple had been destroyed. But it was a very wonderful temple, not as fine as Solomon's but bigger, and it was going to be destroyed. Now the things that He had said is that all of the buildings of the temple are going to be torn down. Actually that happened back in the year 70 AD. That happened very soon after He had talked to them in probably before 31 A D. Might have been about 30 with the time He said this. "What shall be the sign of thy coming [they knew He had told them He was going to come back again and they wanted to know when He would — they thought He would come at the same time. Now He wasn't going to come till 1900 years later than that temple was to be destroyed, but they didn't know that... what'll be the sign of your coming] and of the end of the world?" (Matthew 24:3) Of this world, this world of get — this world of get — Jesus said His kingdom was not of this world, remember? What is going to be the end of this world then? That doesn't mean the end of the earth. That just means the end of this kind of a world — we are going to have different kind of a world. We will go right on living. Now: "Jesus answered and said unto them, Take heed that no man deceive you" (Matthew 24:4). You know when you are deceived; you don't know you are deceived. You think it is the truth. And if you knew it was not the truth and knew it was wrong you wouldn't be deceived at all. But a deceived person is one, who really honestly believes it and is fooled and is wrong, but he doesn't know any better and he doesn't know any different. "...take heed that no man deceive you. For many shall come in my name... (Matthew 24:4-5). Now I have looked up every place in the Bible where it says "in my name" and where people do things in Jesus name and in every case they are like being an attorney and taking His name and acting on it. They are His agent, when they come in His name. "...many will come in my name saying that I AM THE CHRIST...[not saying that they are the Christ — many would come preaching that Jesus is the Christ. Many people have misunderstood that, saying that Jesus is the Christ] and will deceive many." Because they will come with a message about Jesus, but they won't preach His message about the kingdom of God. They won't preach His message about repent of the way of get. They will just say go on in the way of get and you will be saved, if you just say you receive Jesus. I can show you in the eighth chapter of the book of John beginning in verse 30 where many Jews BELIEVED ON HIM, just like many do today. And yet they tried to kill Jesus because they did not believe what HE SAID. Believing on Him is one thing and believing Him, believing what He says is something else again. I said that a while ago, remember. 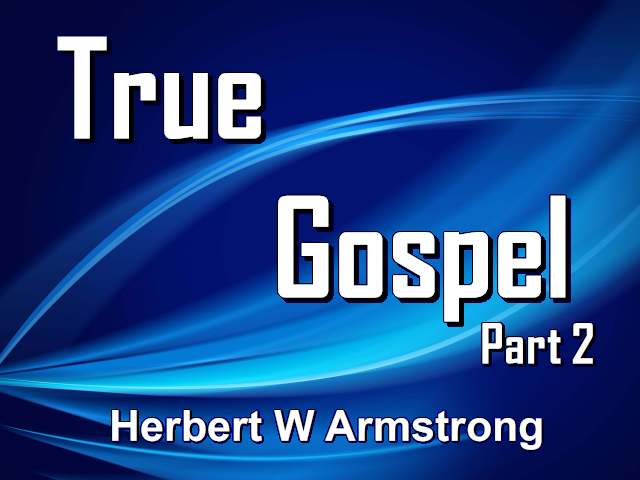 Many will come proclaiming that Jesus is the Christ and that has been going on for over 1900 years and deceiving the world, but not preaching His gospel. Now then I'd like to have you drop down to verse 14 "And this gospel of the kingdom [the gospel Jesus preached about the government of God]...this gospel of the kingdom shall be preached in all the world for a witness unto all nations and THEN shall the end come" (Matthew 24:14). They said when will the end of this world come? THE END OF this WORLD WON'T COME UNTIL SOMEONE IS PREACHING THE GOOD NEWS OF THE COMING KINGDOM OF GOD AND THE WAY OF LIFE OF GIVE INSTEAD OF GET. MY BRETHREN AND MY FRIENDS HERE IN THE PHILIPPINE ISLANDS, I AM PREACHING THAT GOSPEL TO YOU TONIGHT. Will you believe it, or will you be like others and say "I don't believe what God says. I believe what the devil says." Whom are you going to believe? Whom are you going to believe? If you believe the wrong one I'll tell you, you don't have very much longer to live. I don't mean two or three months. Not necessarily even two or three years, but it won't be very much longer let me tell you, because we are right at the time when terrible things are going to happen.